Volk has written many short stories and the excellent TV series Afterlife. There is a similar theme here, of ordinary lives intersecting with something extraordinary, although in this case the extraordinary is not supernatural. Here we find a man who’s extraordinary experience happens because he is spellbound by that most alluring and dangerous of possibilities, the prospect of transforming one’s life. 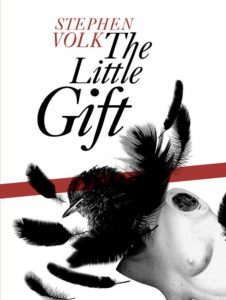 The narrator of The Little Gift is man with some sense of his own banality. He is a self-confessed coward when it comes to taking the opportunities that life might offer. His happyish marriage, his not too rat racy job, look like propelling him into middle and old age without disruption. On a work team building exercise in a Cotswolds hotel he meets Ghislaine, a woman he is immediately attracted to. The mid-life crisis of a potential affair is seen as potentially much more than that, of love, and a new beginning. As he recounts this situation in effectively simple prose we feel in the position of listening to a friend who thinks they are telling us of some wonderful prospect when all we can see is the doom they are propelling themselves towards. Much of this might be fodder for a fairly standard Hampstead novel except that then events turn distinctly darker. We have had hints of this throughout. Ghislaine is unconventional enough to make the attraction understandable and to perhaps be not quite than what at first appears. There is something about her that suggests the life she is offering could be one that broke out of the boundaries of the Range Rover on the drive, the nice house and family. She doesn’t care about looking conventional, she is able to take charge of their initial encounter. When she recounts an experience in an Italian cemetery there is a glimpse of the next world, even in the jokey reference to God on the telephone. When disaster does strike it is unexpected and yet handled in a devastatingly logical way. What follows loses nothing of its power through its inevitability. The honesty of the narrator towards the end won’t endear him to us. And yet we cannot despise him either because through his encounter with another life, another world, he has learnt a truth: that the most that the other world has to offer is the occasional little gift, maimed or dead, not really what we wanted at all.